I was mind-fucked by the movie, literally. The search for extraterrestrial intelligence, SETI, became my passion. I wanted to work SETI Institute. I wanted to be on the front lines when we, humans, have direct contact with extraterrestrial intelligence. I thought only of SETI. I begged and begged for a telescope that Christmas. I got a telescope from my bewildered parents. It wasn’t a big telescope or a particularly nice one, but it got me closer to the world beyond earth, every single clear night for the next several years. The moon and I spent a lot of time together. Hypnotized by its beauty, I felt close to it. I figured I’d catch a peek at some extraterrestrial intelligence roving around the surface of the moon, if I kept watching. Because Ellie, the central character of the movie, “Contact,” had HAM radio set, I wanted the same set. This is the reason I got my first job. It was a weekend commitment at a wheatgrass growing operation not far from my home. I schlepped in the mud, the cold and the utter wetness almost every weekend for over a year. I was 15. I worked that job until I saved my target amount for a decent radio, a thousand dollars. My grandfather knew where to get a decent radio for me. I handed him my hard-earned money. A few weeks later, he brought over a very nice, if used, HAM radio. He helped me set it up and taught me how to use it. As I write this, it occurred to me I became obsessed, easily, as a kid. I found myself on that radio every free minute. I had several interesting conversations, with people from far off places. I found angry people that liked to swear. I found odd people that wanted me to talk about topics I didn’t know anything about or understand. God and Jesus remained silent; so did the aliens. 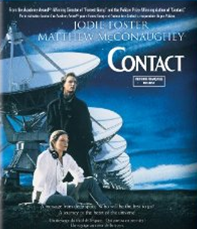 “Contact” also spurred my interest in UFO sightings and contacts, which is one of my closet hobbies, today. I can’t seem to get behind conspiracy theories though. What’s the attraction? Men and women, who seem, somehow, different, create conspiracy theories. That’s my opinion. I can’t say for sure. The conspiracy theorists strike me as having personality disorders and other issues. YouTube, the great time waster, offers a wealth of convincing videos about UFO sightings. I spend much time on YouTube. At worst, it’s fun. I still like to go outside, on clear nights, and look up at the sky. I look, not only to take in the vastness of the stars, but, secretly, I hope to catch a glimpse of a UFO or something for my dreams. It never gets old for me. Watching the movie, “Contact,” is the same; it never gets old. Sometimes, if I’m feeling defeated or uninspired, I slip “Contact” into the DVD player. I feel as I felt when I was a kid. I’ll have things to dream about and things to wonder about again.